Strong evidence abounds for the existence of God and the inspiration of the Bible. But atheists are so certain there is no evidence, they don’t look for it, nor do they want to. This is a workbook that the rare atheist who is willing to do the work can use to examine the evidence in detail. The questions center on the area of the biblical prophecies of the return of the state of Israel in 1948. I chose this set of prophecies because the skeptic can’t use any of the standard excuses to dismiss the evidence. Virtually all apologetic approaches consist of feeding information to the reader or listener. This book is different. It consists of 55 straight-forward and unbiased questions for the reader to investigate and answer. Even though it is a short book, it takes time and effort to work through. I find people learn better when they investigate for themselves, so I don’t force feed answers to any of the questions. The reader is free to investigate the questions using any means at his disposal and give honest answers. In the end, I allow the reader to come to his own conclusions, because I’m convinced anyone who honestly works his way through this book will have all the evidence he needs to know for sure God exists. This workbook comes closer to proof that God exists than any other intellectual approach I know. It requires serious study, but it is very rewarding in the end. “This is a workbook to test the claims of the Bible using only personal investigation, logic, and a little mathematics. It consists of fifty-five straight-forward, impartial questions. Some are very simple, but others will require time and effort to research and answer. All of the questions are necessary, however, to determine the probabilities of the predicted events and test their claimed fulfillments. Since you will be comparing biblical prophecies with reality, some questions will require you to first read those prophecies. I have included references to them so you can read them in any Old Testament of your choosing. “If you accept the challenge, you may use whatever sources you want to do your research: books, magazines, news articles, internet, encyclopedias, subject-matter experts, first-hand experience, and so on. You can do this study on your own or with others. The important thing is that, whether you earnestly want to know the truth, or you intentionally try to prove me wrong, you do your own work, sticking only with the facts. I will not provide answers for you. You will do so yourself, and when you’re finished, you will come up with your own conclusions based solely on the facts you find. Available on amazon.com. Volume discounts are available directly from me. In his letter to the believers at Rome, Paul described his own battles with sin—battles he repeatedly lost in spite of his best efforts. He had to learn victory cannot come through will-power. If we’re honest with ourselves, we will admit the same thing. But then God showed Paul the only way to overcome sin: through the power of the Holy Spirit. This book is available in paperback and for Kindle from Amazon.com, or by special order through your local book store. It is also available as a FREE e-book through Google Play and Smashwords. (Sorry Kindle users: Amazon won’t sell the Kindle version for anything less than 99 cents.) After you’ve finished reading, please consider leaving a short review on Amazon, Smashwords, or Google Play. Download the free complete PDF version here! This is a book to reconnect Christians to their Master. If you’ve gotten caught up in Christianity without Christ, if your relationship with Jesus is one in name or theory only, then this book will help you see and know Him in a new way. It will encourage you to keep looking, listening, and especially following Him on your own. 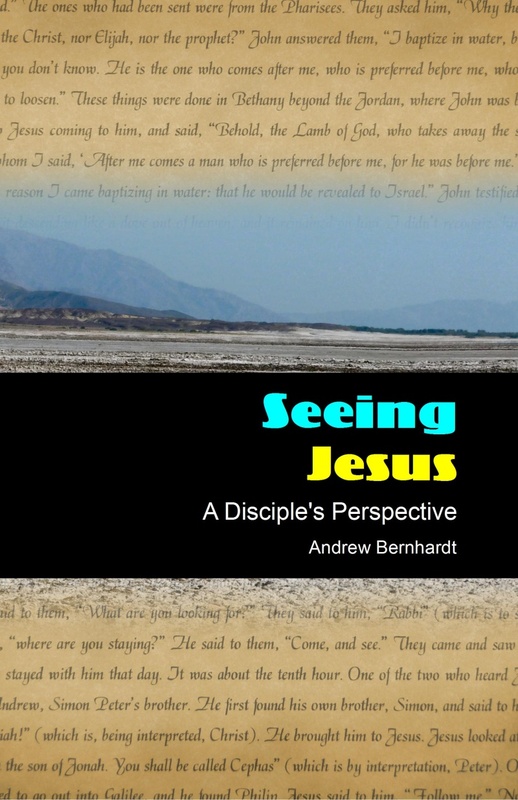 ‘Seeing Jesus’ is a short, easy read, with a strong discipleship focus. It is written in four parts, each of which can be read by itself. For more information, check out the F.A.Q..